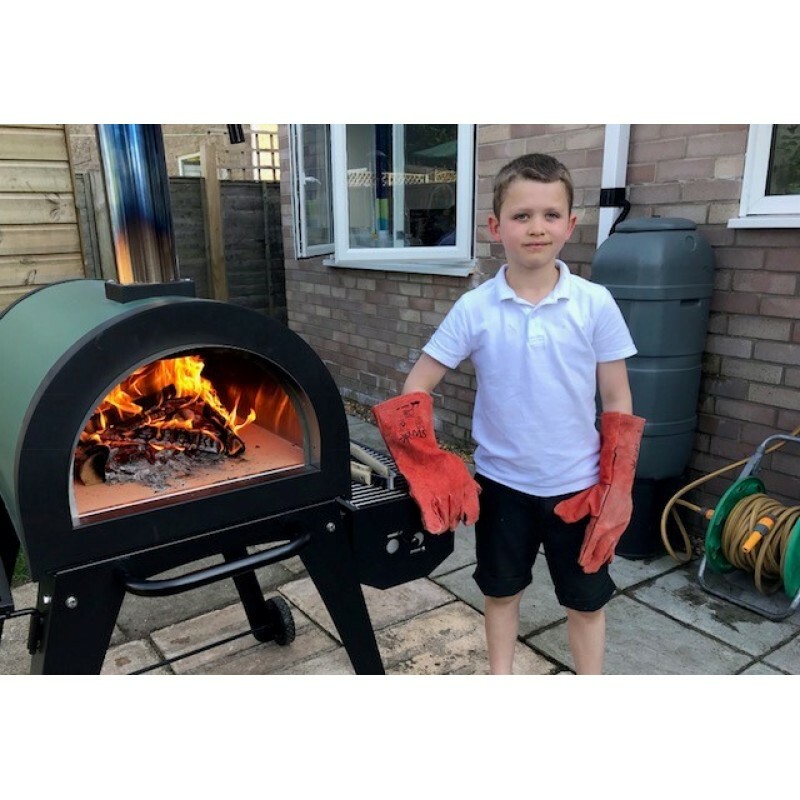 We have amazing reviews on Trustpilot and Twitter, from people who cannot believe the value for money this pizza oven offers. 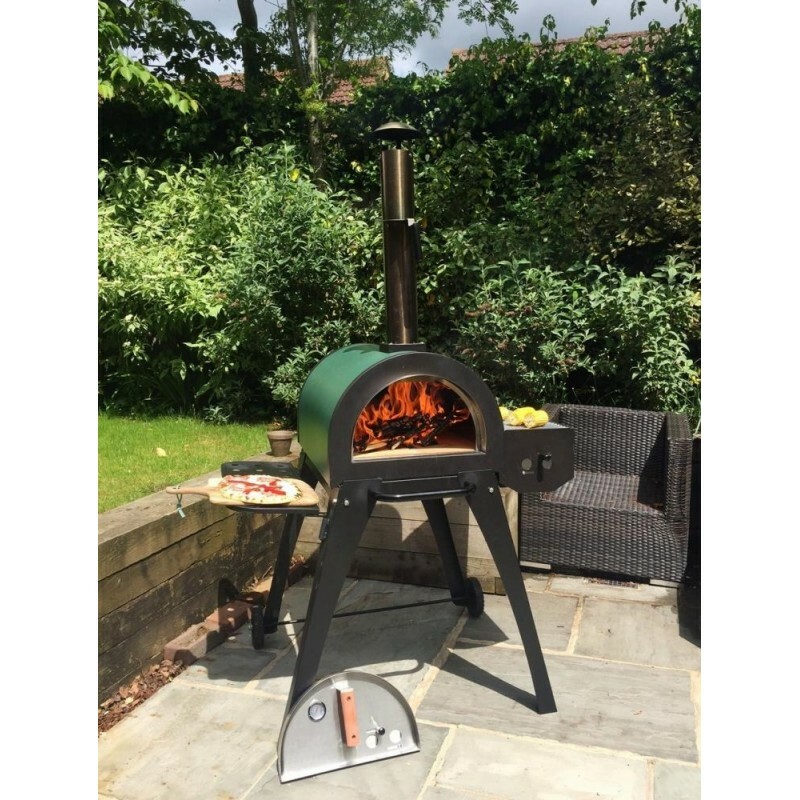 Cove's 82kg Green Machine is the ultimate universal outdoor accessory, which allows you to stone bake Italian style pizzas and other exciting dishes. The removable coal grill that hangs on the ovens side allows you to BBQ at the same time. Pizza ovens are a great way to bring the whole family together, and are a fun way of introducing children to cooking. 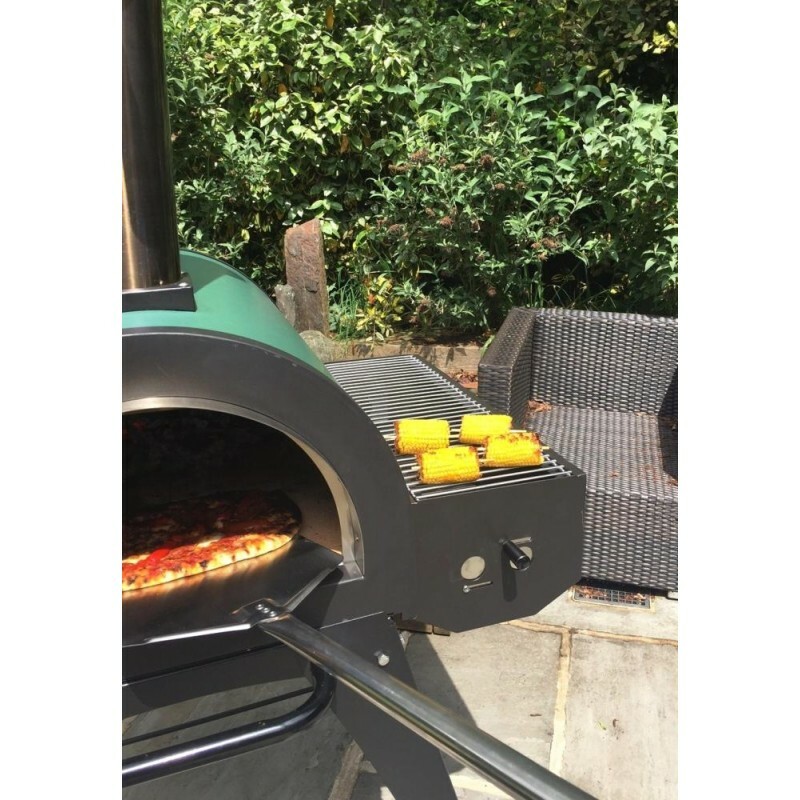 The simple to construct stand with wheels, allows the oven to be easily moved around the patio making it a lot more versatile than traditional static brick-built ovens. The oven has a stainless steel inner shell and a painted steel outer shell. Sandwiched between these two layers is a fire retardant insulated layer, that locks the heat inside the oven in a very similar way to traditional brick ovens. The oven is almost cool to touch on the outside thus proving the insulated core is working well. The oven chamber itself is 700mm Deep, 460mm Wide and 270mm High. The oven can fit a sizeable pizza or anything you fancy cooking in the oven; its uses are endless. The advantage of having a stone base, is that the heat stored in these stones is transferred directly through the pizza / bread that is placed directly on it. The oven will retain the heat for hours and is perfect for cooking other dishes including lasagne and casserole. The oven's radiating stone base and insulated layer allows users to cook thin, Italian style pizza in as little as 2 minutes! Stainless steel inner shell, thick insulated core, steel outer shell. 1.5mm stainless steel door with wooden handle, adjustable air controls and temperature gauge. 1mm 201 stainless steel oven, with insulation and green painted outer skin made from steel. Removable side shelf (left hand side) - Perfect for utensils and pizzas about to go in the oven. NB. Fitted Covers, Pizza Paddles and Brushes sold on the website but not included. 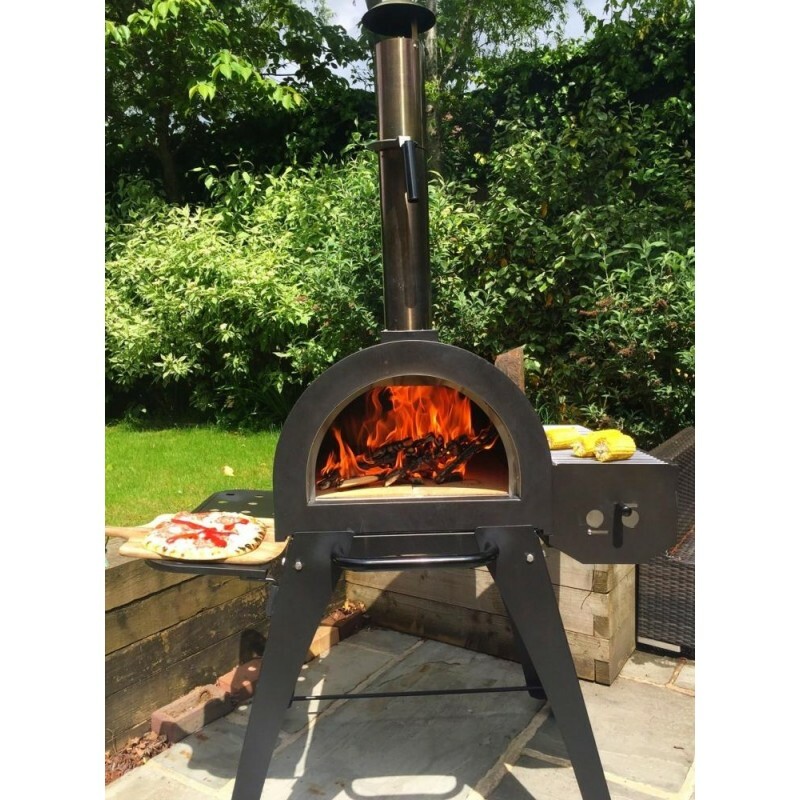 This is a very common question and the answer is simple: this pizza oven is designed by our team, constructed in our factory and distributed directly from us to you. We are also an internet-based company with no showroom, so all of these factors combined means we can offer a fantastic pizza oven at a very good price. PLEASE READ - The Green Machine outdoor pizza oven comes with a temperature gauge above the top oven. We have found this "smokes up" and gets very dirty and difficult to read, We are asking people to keep this in mind before buying and not rely on this gauge - we suggest a hand held temperature gun like this one on eBay - they are a lot more accurate and reliable. Please note that this is the price for delivery of Green Machine, Outdoor Stainless Steel Pizza Oven With Stone Base + Side BBQ only. The final amount might change depending on the contents of your shopping bag when you check out.